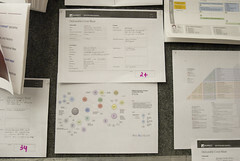 During the last IA Summit, Jacco Nieuwland, Nathan Curtis and myself organized the first Wall of Deliverables, a display area dedicated to documentation and tools used to convey and articulate the work that we do as UX professionals. Check out more photos from the Wall of Deliverables. We had a great crowd viewing and discussing the displayed deliverables all through the summit, thanks to a bunch of people who took the time to submit an entry. We were very satisfied with the results and received a lot of valuable feedback, so of course, we are doing it again! To give you a sense of what it takes to make it happen, we’ve had two planning meetings so far where we discuss lessons learned and reviewed all feedback in detail, then started planning what steps need to be taken to set it up next Summit. We have to figure out what kind of space we are dealing with (determined by the IA Summit organizers) so we can design the best walk-through flow and allow for people to hang out and discuss. We learned from last years that having to squat and squint was not the best thing for the deliverables that were hanging low on the wall, so we’re trying to get more horizontal space to ensure easy access and allow the deliverables to be more spread out. We also learned that our entry form was taking more space than it needed and not helping convey as much as we wanted, so we’re picking more appropriate fields and designing is so that it’s legible and so that you can see the submission number from space. The voting process was pretty smooth last year and the feedback indicated people were very satisfied with the prizes, but we’re looking into new options to make things fresh. If you’d like to sponsor, drop me a note! 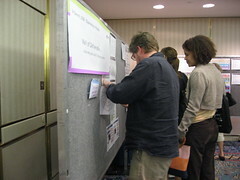 One of the most effort intensive aspects of this initiative is to spend time hanging out around the Wall, helping contributors include their deliverables and answer questions from the crowd. Last year we conveniently placed a printer right there, but we really want to encourage people to submit and print in advance next time. It still is a lot of effort so if you would like to volunteer 30 minutes of your time to help facilitate, let me know! We are toying around with some other very exciting ideas that I was planning on writing down on this post but that I just realize it will be much more fun if they are a surprise, so I’ll just leave it at that! Nathan, Jacco and I will start broadcasting to the various UX outlets that you can submit deliverables as soon as we have our first to-dos out of the way, particularly coordinating with the IA Summit committee about how the Wall of Deliverables will be part of the program and how we’ll make people aware of what’s going on throughout the event. If you have ideas, suggestions and comments, please let us know! We tried something similar at Oz-IA/2008 but didn’t get many submissions at all. It was the first year we did it though, so maybe people are just not familiar with the concept. Any suggestions on how to get more submissions? Ping me if you want to talk. We put a lot of effort into making it happen. This time we are starting earlier and putting even more effort into the submissions to boost the number of deliverables. I definitely have some ideas for what works and what doesn’t. Hey Liv, thanks for the tips on setting this up at EUROIA 2008. Also, like OZ-IA, I think the idea is still a bit new. 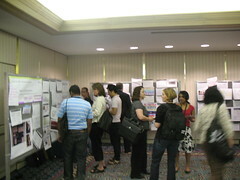 In Europe, everyone’s much more familiar with the traditional poster session. Next year, the “IA Jam” will be a much more organised affair. We’re inviting everyone to bring deliverables, laptops, posters, art anything which communicates IA principles at work. And like this year, the best three will be voted on by everyone and get their registration fees reimbursed. Hurrah! I’m very glad to hear about next year though! As always, I’m happy to exchange ideas — and if there is anything the IA Institute can do to help, let me know!